It seems easier to get a Japanese permanent residence visa than to get a tour around the Chateau Kamiya brewery. You can easily see it from outside, but the frosted up windows from the permanently running aircon means it’s tough to what is happening inside. Moreover, with eleven fermentation tanks taking up most of the storage room, you can’t see what it happening in there either. So the only thing left to do is get a tour though during the Golden Week Festival, tours are limited to 10 people per group, and three groups per day. So with haste and fortune, Kakui-san gave BeerTengoku a personal tour around the brewery, with no holds barred and (almost) no questions forbidden. Hard to get a decent shot of the tanks in such a small space. Chateau Kamiya has an annual production of around 80kL of beer per year, though they are on a happoshu license as well as a beer license, so it’s hard to determine the quantity of each. 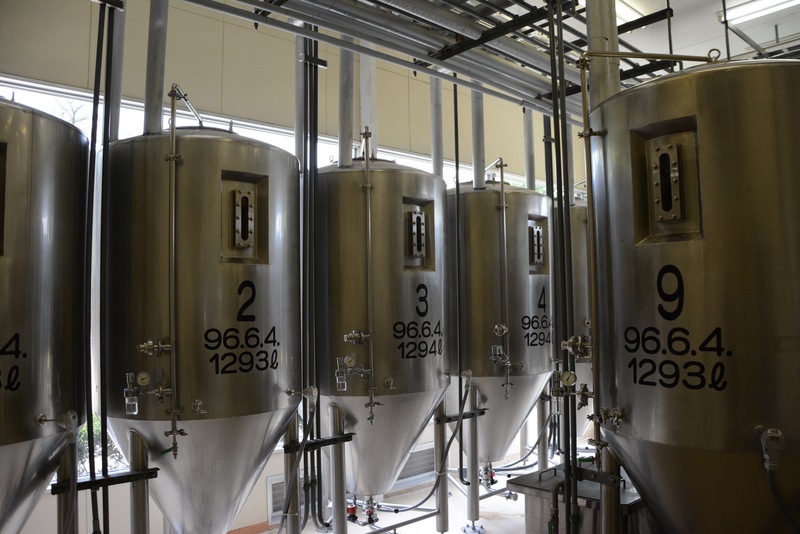 However, everything starts off in the lab, which was one of the most hi-tech areas we’ve seen in a brewery in Japan. Erlenmeyer flasks are dotted around between burettes, condensers, microscopes and amino acid analyzes along with devices for measuring IBUs of beer electronically and pH level detectors. 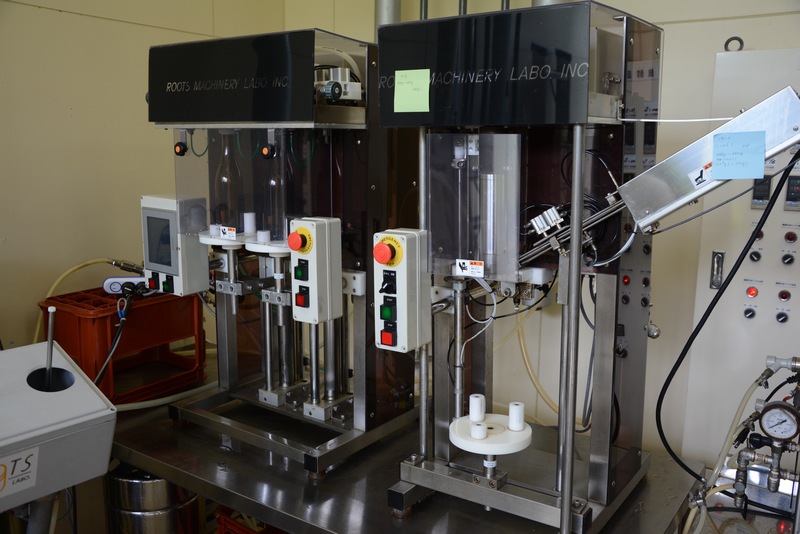 All beers are quality controlled and checked using this instrumentation and most importantly, all beers are first made on a small scale and then tested. Kakui-san thoroughly explained what each device is used for and the steps involved in the processes in getting a new beer approved. If a beer fails in any of the aforementioned processes, the batch is dumped and remade, though he’s happy to admit that no batches have been dumped. As much as I didn’t want to move on from the lab, all those toys looked so much fun and I could have spent the rest of the day asking questions about them and playing with them, Kakui-san was eager to show me around the rest of the brewery. 80kL sounds like a lot of beer but it puts Chateau Kamiya in the midrange of Japanese craft beer production. During peak times, the restaurants and annual beer festival gets through between 10kL and 20kL of beer a month with the rest of the year being around 5kL to 10kL a month depending on the weather. This production was higher up until 2013, when the parent company Oenon started to reign in the locations where Chateau Kamiya draft beer was sold on tap to just the local restaurants, where around 500,000 visitors annually visit. The lab has its roots firmly in the background of Godo Shusei’s research side which allows Kakui-san and fellow brewer Sano Rie to keep a firm control of the quality of the product as well as enabling them to cultivate and grow their own yeast, such as the Sakura-kobo, a yeast extracted from some of the 500 cherry trees located on site. Mash on the right, lauter on the left. The production starts in the small brewing room across from the lab where the mash and lauter tuns are kept, conveniently next to the milling machine; stocked full of German and British malts. Kakui-san proudly displayed the malts and emphasises the point that everything at Chateau Kamiya, besides the boiling and cooling process are done by hand as much as possible. Even the boiling and cooling process are controlled by switches which the brewers have to operate. Kakui-san explained that this was to ensure that all the brewers still maintained as much of a hands on experience as is possible while reducing mistakes. The 1000L tanks are situated next to each, minimising distance and are connected up via a mish-mash of hoses and pipes to the next room. In the next room, the smell of fresh beer permeates through once Kakui-san has turned off the air-con and air filtration units. Before that, there was no distinct brewery smell I’ve come to expect when we walk around breweries. In the fermentation room, there are eleven tanks that can be partially seen from outside, each holding 1000L of beer. Kakui-san and Sano-san brew two to three times a week, sometimes more, with each fermentation tank holding a different beer. Moreover, the tanks are also used for the aging process, a process that is usually split into two different tanks. The special in-house yeast also prevents the beer from becoming cloudy, a trademark of their original range of beers: the pilsner in particular is a clear golden colour. The yeast in the process clumps together and drifts away allowing for easy filtration of the beer. Bottling still done by hand. If things weren’t stressful before, Chateau Kamiya still bottles by hand, well, almost by hand, preferring to use a semi-automatic machine that fills two bottles up at a time after being washed two at a time. 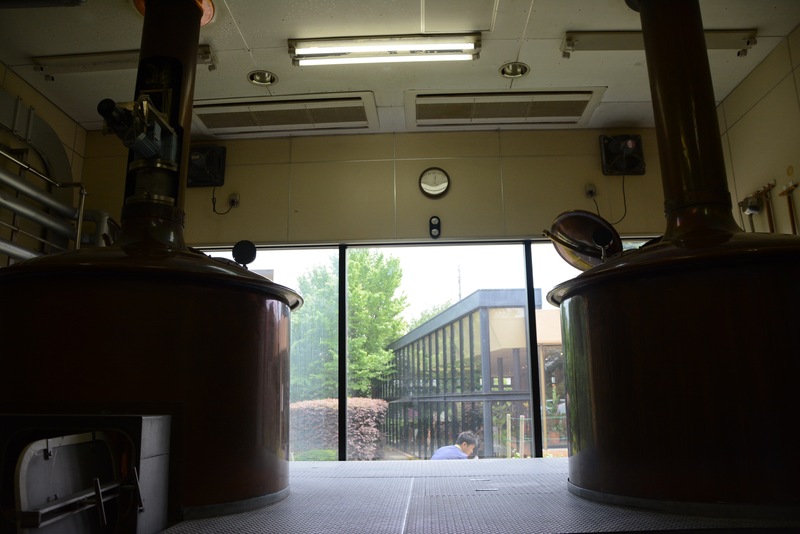 Those beers are then capped by hand, which means the beers produced at Chateau Kamiya only have a shelf-life of a maximum of three months, depending on the beer. The brewers do have some part-time help during the busy periods, such as the Beer Festival in Golden Week, though Kakui-san and Sano-san tend to bottle themselves, with Kakui-san reaching a peak of around 700 bottles a day. When asked what he does during this time, he smiled, laughed, and said he zones out of the work, not evening offering to chat to others. Of course, the restaurants and the BBQ garden use kegs which are also filled up by hand, with each keg containing 20L. Noone is exempt from this work, with Sano-san proudly showing off her muscles and laughing as I ask how much each keg weighs (about 30kgs for those wondering). From here, the kegs are stored in the fridge next door, waiting for the thirsty crowds, clearly on show during the Chateau Kamiya Beer Festival at the end of Golden Week. Kakui-san led us back to the entrance and as one last surprise, pointed out that Chateau Kamiya has also started to grow their own hops too, a unique hop known as … that Kakui-san is eager to try using in some new beers. Though when pushed, a big grin wraps across his face, points out the special beer section on the leaflet I’m holding and tells me to wait. “Maybe a sour” he says, or perhaps “some stronger IPA” who knows. With that, he apologises for having to leave as he has to help out with the festival, but comes over for a chat and asks my opinion on the beers on sale before darting off to water the ground. Kakui-san may be a brewer but the whole spirit of working together and no worker being too good for any job prevails through.